Birman cats breed information and advice. Birmans were made for cuddling. With beautiful silky fur, inquisitive blue eyes and of course those pure white paws and big bushy tail, the Birman is one of the most eye-catching of cat breeds, and certainly one of the most loving, which has led many to put them on a pedestal as the perfect pet. Anne Madden, vice chairman of the Birman Cat Club has nothing but praise for this breed: "The Birman cat makes an ideal pet. Not only are they very lovely to look at, but are affectionate and gentle. The only thing better than one Birman in the house is two, or even three." As far as companionship goes, you couldn't ask for a better buddy as Anne explains: "They were bred as companion cats for so many years; they love human company and are very curious, wanting to assist in all the household and garden chores." Amy Wilcox of the Northern Birman Cat Club and editor of the club's magazine has four Birmans of her own: "Birmans are so laid-back, friendly and are ideal house cats. They aren't overly boisterous but are very intelligent. They make great family pets and are great with children and dogs as well; they are so easy-going!" As they are so attached to humans, Birmans can become lonely and bored if left alone all day so it is wise to have two cats, or another animal companion to keep each other entertained if the house is empty during the day. What about exploring? "They are definitely indoor cats," Amy continues," Mine have the option of going outside under supervision if they want to, but one doesn't like going out and the others can take it or leave it. I'd say Birmans would be happiest if they have access to an outside run so they can go out if they want to." Sylvia Pritchett, secretary for the Seal & Blue Point Birman Cat Club, says: "As any cat lover will know, cats will only be as involved as they want to be. Birmans, however, really get involved! They are often described as 'moreish' - I don't think I know a single Birman owner who has been owned by only one Birman! While they have 'in your face' confidence, they have a lovely temperament - they are never aggressive or spiteful, but are very loving and affectionate. They can, however, be pushed too far - in which case they will warn you with a 'huff' that they are losing their patience." 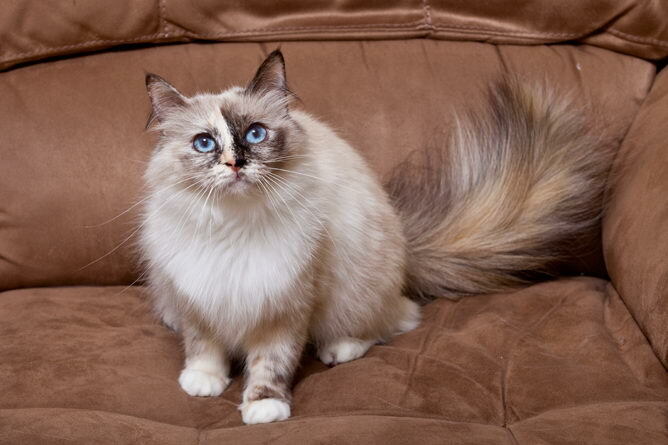 Birmans are a medium-sized breed with semi-longhaired, silky coats. They have moderately set ears and round, sapphire-blue eyes. The breed is always pointed, with colour developing on the face, ears, legs and tail. Their coats are usually cream rather than white, but this depends on the colourpoint. There are 20 colours available, including the original and most popular seal-point. Lilac-, cream- and red-points are the most delicate-looking of the breed, but you can also find Birmans in blue and chocolate. Both tabby and tortie patterns have been introduced, and some UK breeders are working on bringing silver, cinnamon and fawn to the standard. Of course, a Birman wouldn't be a Birman without his trademark white gloves and socks! As with all colourpoints, Birman kittens are born completely white. Their colours begin to show between seven and 14 days old, but are not fully developed until they reach two years old. Pet-quality Birmans will cost around £500 each. Visit the litter with the queen present and, if possible, the stud. Buy a kitten that's been brought up indoors and is well socialised, and choose one that's lively and friendly with clean ears and bottom. It is claimed that Birmans were originally kept as companions by holy monks living in the mountains of Burma, at the Temple of Lao-Tsun. The first two Birmans to reach Europe were sent to France as a gift to Major Gordon Russell and Auguste Pavie, who helped to defend the Temple in the early 1900s. The male cat died on the long sea voyage, but the female was pregnant and she produced the first litter of European Birmans. Sadly few Birmans survived World War II, and it is only because of the dedication of their breeders that they still exist today. By 1955 the breed was very popular all over Europe and was imported to Australia in the 60s. When Elsie Fisher and Margaret Richards saw the cats in France in 1964, they fell in love and worked on getting Birmans into the UK. The breed was recognised by the GCCF in 1966 and has continued to flourish ever since. Generally a very healthy breed, Birmans - as with other semi-longhaired breeds - do suffer occasionally from Hypertrophic cardiomyopathy (HCM), although breeders continue to make sure that affected cats are not used for future development. You'll need to watch out for signs of kidney disease too. Birmans are not difficult, or particularly expensive, to keep and any good quality proprietary cat food for their diet will be fine. They have no undercoat so they're less prone to matting and, other than a yearly moult to shed their winter coat, they only need a quick brush once or twice a week. Sylvia also recommends regular dental check-ups to keep teeth healthy, and claws are easily clipped to keep them furniture-friendly - like grooming, start training your kitten to accept having his claws clipped from an early age to avoid any dramas as he gets older. If you're looking for an affectionate cat who loves playing as much as snoozing, the Birman could be the cat for you. If you live near a busy road or you don't have a garden, a Birman can enjoy life as an indoor cat - but make sure there are plenty of toys and activities to keep him occupied. If you decide to let him out, try to keep him in a safe, enclosed area so that he doesn't roam too far. Birmans cannot cope very well on their own, so owners who work all day would do well to make sure their cat has a companion - another Birman would be perfect, so they can keep each other entertained. Simone Ensor has a bustling brood of 11 Birmans - but wouldn't have it any other way. "We first heard about Birmans in 2003. We didn't want to get a dog but we weren't keen on getting a moggy; we were looking for a dog-like cat. We found Birmans in my daughter's cat breed book. They were good with children, good for families - they sounded perfect! "Birmans are pretty bomb-proof. They're just lovely. We've had a couple of kittens go to special needs homes, and some of them became pet therapy cats in hospitals. They're a beautiful breed and I couldn't imagine life without them. They love to play fetch and they'll meet you at the door when you come in. "Last year, there was a burglary at our house and we had four eight-week-old kittens stolen from our kitchen. I was heartbroken and couldn't do anything at first. When we got them back a week later, they were in a terrible state - one of them, Sunny, had been marked with a yellow highlighter. Both girls were traumatised. Lara's never been right since and she's not wanted to be near humans. Usually, you're able to pick Birmans up but Lara won't let you now. "We have a lot of Birmans here. We always say, one Birman leads to another! Our eldest is Mr Binks, a lilac-point boy who turns 12 this year. He's very laidback, a bit like Barney Rubble - he's got a beautiful nature. Thalia is our blue-point matriarch. She's a year younger than Mr Binks and she's definitely my cat. She has to sleep next to me and she's very good at the 'Birman nip'. Cassie is the mum of our last litter of four kittens, the ones that were stolen. She's a red-point and a great mum - she's still washing the two babies that are still here, even though they're eight months old now. "Tess is our naughty seal-point tortie! She's Cassie's daughter from 2008 and she's a complete diva. She's a marvellous show cat and she knows it - we call her the Marilyn Monroe of the cat world. She's just stunning all the time though. "Tess is an attention seeker though - she'll knock things like house plants over if you're not taking any notice, and she can be a bit boisterous and tell the others off. It's not very often that she has a placid moment! "Minnie is two-and-a-half and Thalia's blue-point daughter. She'll climb up your tummy and on top of your shoulders, and she loves getting up to the tops of doors as well. She and another tortie, Prinny, are the same age, and best friends. You can carry Prinny around like a baby. Lilac-point Circe is also two-and-a-half. She fell off a cupboard last year and broke her leg and she had to stay in a cage for six weeks. She was good as gold though and never tried to get out until her leg was better. "Next, we have the kitten girls, Sunny and Lara. Sunny is a loving little girl and very dog-like. She won't sleep during the day and wants to be with you 24/7. Unfortunately, Lara is still traumatised from the burglary last year. She would purr on your lap before but she's not the same cat anymore. We don't know what they did to her in that week but we're making steady progress. "Finally, we have our seal-point tabby, Teddy, who's one-and-a-half, and two stud cats of the same age, blue-point Angus and red-point Ricky. They're gorgeous. Because we have so many cats and we use them for breeding, we make sure we segregate them and alternate which are in the house and which are in the cat houses outside. It saves them from getting stressed. "My advice would be to do your homework before getting a kitten to make sure a Birman would fit in with your lifestyle. They're pretty easy cats. You only need to groom them occasionally and they'll get the odd knot in winter, but it's not a problem if you keep on top of it."